So I thought it would be good to review something a little out of the centre of Oxford, as most of our content has been there and I put a poll up on the Instagram page where a lot of you were keen to see stuff to do in Oxfordshire too. So here we have it, on a rainy and somewhat dull Saturday we decided to go to The Oxfordshire Golf Club, Spa and Hotel for some afternoon tea. It is set in beautiful grounds in the Chilterns, a few minutes drive from the market town of Thame. The Oxfordshire is a luxury four star 50 bedroom Hotel and Spa with a Championship Golf Course of outstanding quality. The Oxfordshire is considered to be one of the most exciting golf courses in the country. Previous host venue to major tournaments such as the Benson & Hedges International, Andersen Consulting World Championship and Ladies English Open. Recent accolades include, top 50 places to Stay & Play voted by Golf Monthly magazine, Top Golf Course in the county voted by the Top 100 Golf Courses in England and awarded 4 Bubbles by The Good Spa Guide. On arrival we drove through the entrance and up the sweeping bendy roads taking in the stunning scenery and eventually arrived up to the car park. We entered the big grand reception and were greeted warmly by both receptionists and explained we had booked some afternoon tea. After being shown up to the Lounge Lakes bar, we sat down and this is where it started to get exciting. The atmosphere was pleasant and relaxed as we sat down in our afternoon tea area which was clearly laid out ready for us. I would describe the Lakes Lounge bar as classy but slightly dated in decoration and furniture, for example the carpet and chairs. My only other niggle was that the table was really low so it’s not ideal for eating a full meal but just fine for afternoon tea. Aside from that it is a really nice place to be and has stunning views of the golf course even on a dreary day like this. In the summer I can imagine it would be a great place to spend a day even if you don’t play golf. Shortly after being seated we were offered drinks. We opted for two lattes. They were both nice, you can tell they came from a push button coffee machine but that didn’t matter too much because they looked and tasted the part. 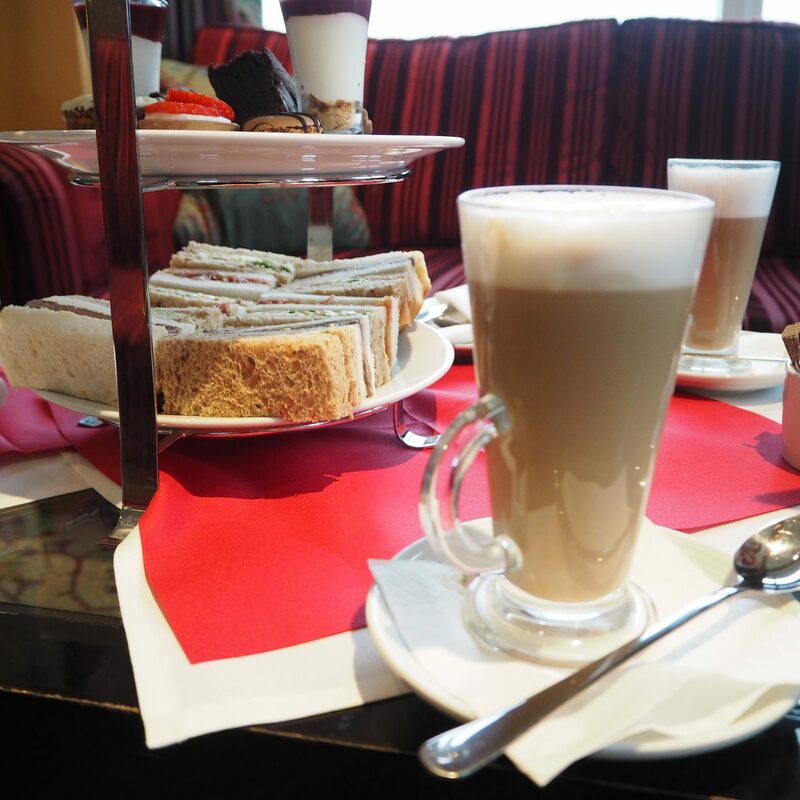 As you can see in the picture below, the Oxfordshire put out a really good selection of sandwiches, desserts and scones in their afternoon tea. The first tier included two scones with plenty of fresh clotted cream and two pots of jam. The second tier included two mini macaroons, two pieces of fruit cake, two brownies, two brandy biscuit, cream and berry pots, two strawberry and cream mini cakes and two brownies. The third tier included a great selection of sandwiches too which included the usual salmon and cream cheese, egg and cress, beef and mustard as well as ham hock with ketchup. 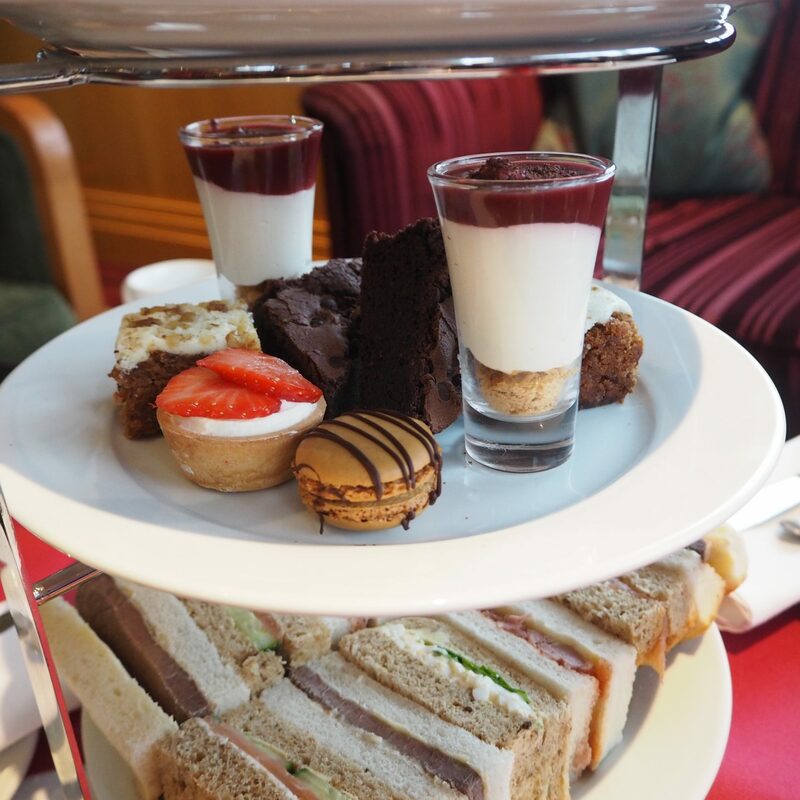 If you would like to book afternoon tea at the Oxfordshire, it will cost you £39 for two people. I think it is worth this, the biggest selling point is the beautiful setting and warm atmosphere. The quality of food more than justifies the price and I would suggest trying it if you are wanting to do something outside of the city and are in Oxfordshire. It’s really close to the M40 motorway so if you have access to a car it is very easy to reach. Overall I would rate my afternoon tea experience at the Oxfordshire as a 8/10 and would come back again.